The advanced engineering arm of the Williams Group has designed and manufactured the Babypod 20 in collaboration with Advanced Healthcare Technology (AHT). The hi-tech carbon fibre transport devices – which can withstand a 20 G-force crash – have been launched in Intensive Care Ambulances used at Great Ormond Street Hospital and run by the Children Acute Transport Service which also advised on design requirements. … has been designed to provide the environment that a baby needs at a significantly reduced price of a standard transport incubator. Lightweight and easy to handle, Babypod 20 can attach to any transport stretcher whether on a trolley or in an ambulance, car or even helicopter. The parallels between a Formula One car and transport device for babies may not be immediately apparent, but both demand a lightweight and strong structure that keeps the occupant safe in the event of an accident, and can monitor vital signs whilst remaining easily transportable and accessible. Williams has taken the existing Babypod product and worked with AHT to create a device that is not only more compact and user-friendly but, crucially, can be scaled up in its production. Furthermore, accessibility has been improved with a slide and tilt mechanism to give greater ease of access for hospital staff. New, sleek styling has also been employed by the team. Sedna Lighting, a British based LED lighting manufacturer and global distributor is highlighting young engineering talent in partnership with Cardiff University. It’s supporting the local Cardiff Formula Racing Team and creating new opportunities for the young engineers of the future. The partnership highlights the University’s school of engineering and Formula racing team. In a collaborative test of racing light in the dark, Sedna Lighting raced the CR12 series car around the home test track at Llandow. The car, fitted with 1,500 individual LEDs from Sedna’s flexible LED strip range, was the joint effort of designers from two universities (Cardiff University and Cardiff Metropolitan University), film makers and engineers who translated the brief idea into a realistic design and created an inspirational video featuring the project. This time Formula 1 style driving was given an unexpected twist with driving taking place in the night and cars generating exterior lighting on their own. You can see what they got up to here. Williams Advanced Engineering has been awarded the 2015 Simms Medal by the Royal Automobile Club in recognition of home-grown British automotive engineering talent. The Simms Medal is only awarded in years when the RAC’s Technical Committee deems there have been contenders of sufficient merit. Williams Advanced Engineering has been awarded the prize for its work in creating the batteries that are currently powering the cars racing in the Formula E electric racing series. 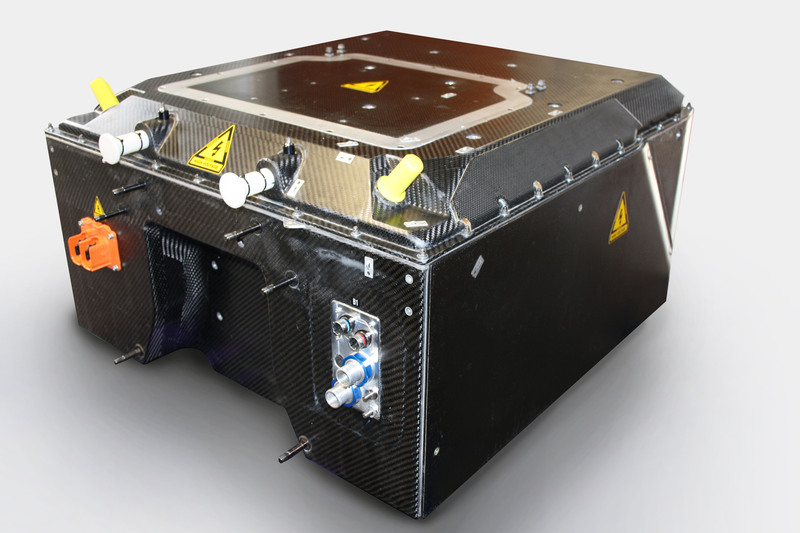 The Formula E battery had to be designed from scratch within 12 months and to a strictly pre-determined safety cell, cool sufficiently, be 100% consistent from one team to the next (40 race cars plus spares), and last an entire season with no loss of power or performance. The batteries showed remarkable reliability in the inaugural Formula E season, with only one failure in 440 race starts. Williams Advanced Engineering is only the eighth recipient of the Simms Medal, with previous winners including Richard Parry-Jones CBE in 2007 for his contribution to the automotive industry; Ben Bowlby in 2012 for his ground-breaking DeltaWing racing car and Lord Paul Drayson in 2013 for world record breaking achievements with the Drayson B12/69 LMP-type EV racing car. 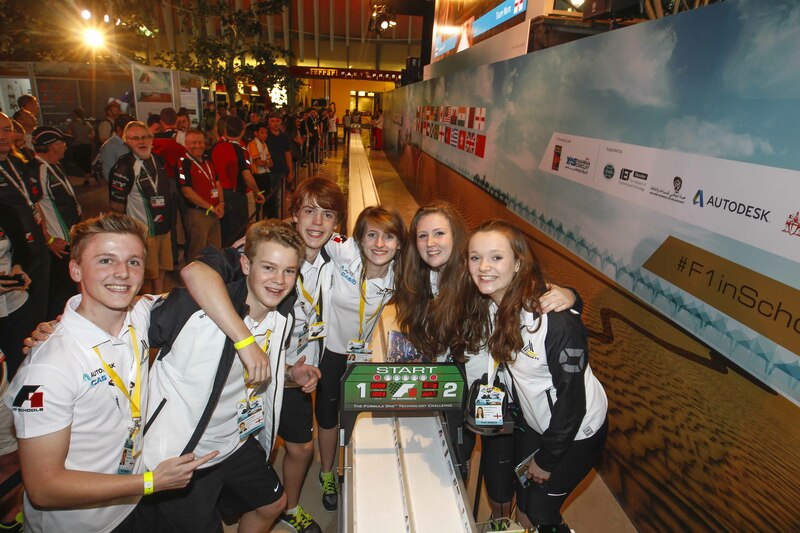 Colossus F1, an F1 in Schools team representing England at the 2014 F1 in Schools World Finals this week in Abu Dhabi has claimed a new world record with the team’s car sprinting along the F1 in Schools 20 metre race track in a time of 1.003 seconds, shaving nearly two-hundredths of a second off the previous record – 1.020 seconds – held for seven years by Northern Irish team, TEAM FUGA. The record-breaking run was not without controversy. Just as in F1, the team were challenged for pushing the boundaries of the regulations, with the fastest of the team’s runs using an air cushion device at the start gate, an innovation designed by Colossus F1 to minimise air loss when the car was released. The team, however, believes that another of its ‘innovations’, a water tunnel test programme, also gave it the edge which produced the world record time. 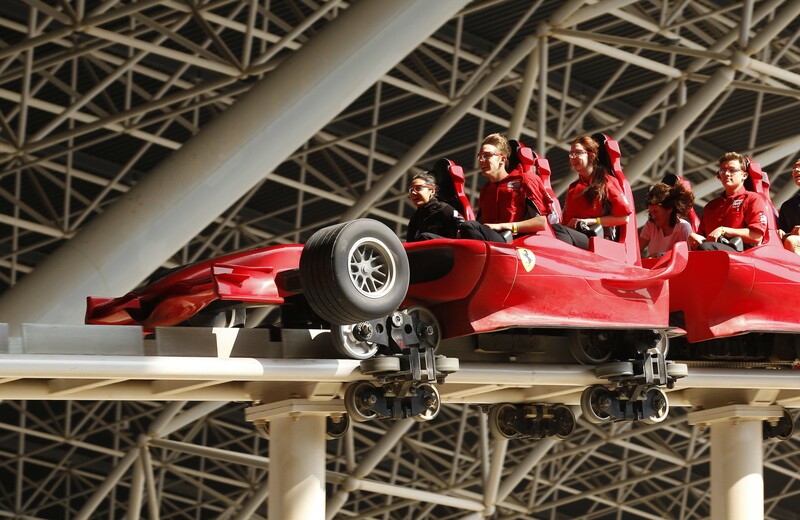 The opening ceremony of this year’s event, being held at Ferrari World Abu Dhabi, preceded the first day of judging in this global educational initiative, with the 38 teams in the spotlight for the first of two days of intense scrutiny with verbal presentations, pit display and portfolio assessments and plenty of high speed action in the racing time trials. Celebrating 10 years of the international F1 in Schools competition, the event was opened by Al Tareq Al Ameri, Chief Executive Officer of Yas Marina Circuit. Just under four hours later Colossus F1 broke the world record.